This Greek Pasta Salad. I made it for my own supper while Tom was at wings and I loved it. Leftovers are even better! I’ve been dying to try these Cheesy Party Burgers and got my wish this past weekend. They were warm and toasty and cheesy and everything I’d hoped they’d be. I’ve made these Chocolate Chip Cookie Dough Balls THREE times in the last while. Such an easy treat to whip up and keep in the freezer for snack attacks. Zoodles! My sister got me a zucchini noodle slicer as a housewarming gift and I love it. Last week I served them with meat sauce and Tom, a zucchini hater, even gave them the thumbs up. Plus, I didn’t get that weighed down, sleepy feeling I usually get after eating actual pasta. Win! Ben & Jerry’s Coffee Toffee Ice Cream. I saw this at 7-Eleven one random night and had to have it. Now it’s my new fave flavor. 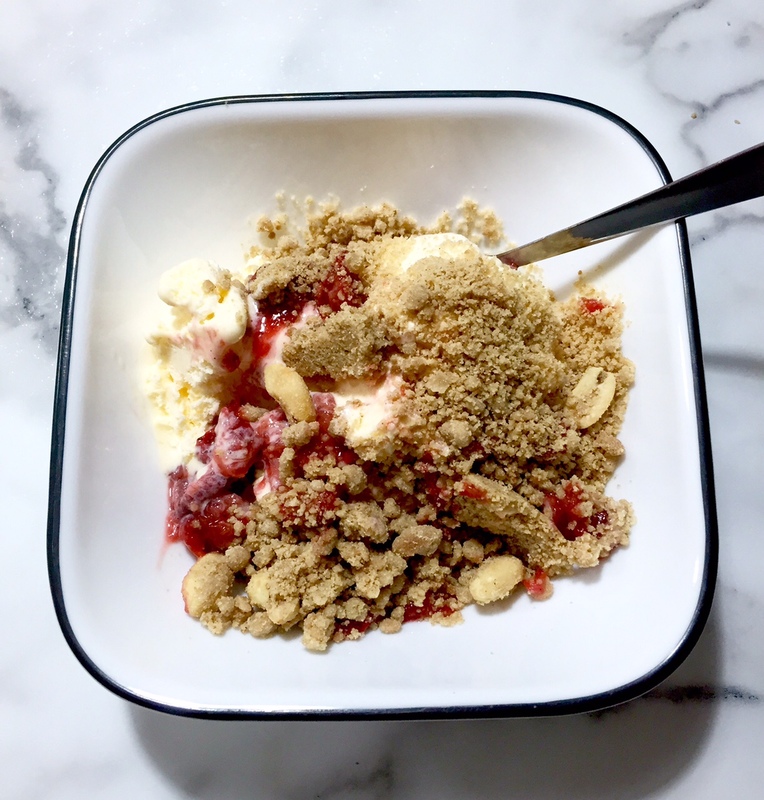 I made a roasted strawberry rhubarb jam in the oven recently and it’s been the perfect ice cream topping, especially with this stovetop crumble. Looking for an even easier Summer dessert? We grilled pineapple slices one night and topped them with ice cream and caramel sauce. So good! I made these Morning Glory Muffins for a weekend breakfast and they were hearty and perfect. I also made a ton of modifications to the recipe and it was very forgiving, which is a bonus in my book. Tom’s relatives from BC came down for a visit and brought a wealth of fabulous BC cherries. We’ve been snacking on them nonstop. The ultimate chicken burger: a BBQ spiced grilled chicken breast, crispy bacon, cheddar cheese, lettuce, special sauce and Sobey’s “Ultimate Burger Bun”, which I found in their bakery aisle (duh). I order chicken sandwiches often when I eat out and this was as good as or better than anything I’ve ordered in a restaurant. Tom raved over it. The key is in the details I’ve learned. Thick cut bacon, sliced real cheddar and splurging on the best buns you can find. I used Epicure’s special burger sauce mix and highly recommend it.